It's A Dan's World: HAPPY ST. PATRICK'S DAY! Hope everyone's doing something to mark the occasion, four leaf clovers, and Kilkenny in hand! 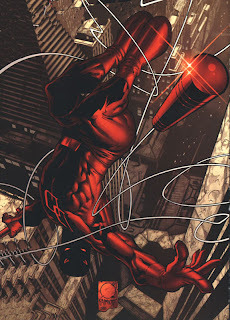 From me, here's a gratuitous pic of the best Irish-American hero, choc-dipped in a lifetime of 'Catholic guilt' - Daredevil. If full Irish is more your flavour - and you can handle a bit of salty language - get the best quotes from Cassidy (comics top Irish lad), and all of the other stars of Vertigo's Preacher, here.